I am reminded of my favorite quote from Mark Twain. “When I was a boy of 14, my father was so ignorant I could hardly stand to have the old man around. But when I got to be 21, I was astonished at how much the old man had learned in seven years.” On Father's Day, with progeny close at hand, delivering pearls of brilliance is a challenging task indeed. For a father, the key to this whole operation is to focus on advice that will make the lives of their children better for as long as they live. An extra bonus is for those children to pass along this critical knowledge to their children. My late father, Big Don, left me with all sorts of life lessons that continue to guide my path even today. One of his favorite observations about life was this: “If you have to tell someone you are – you ain't.” Grammar aside, what he pointed out was that if someone has to actually verbalize to you that they have a particular quality, they probably don't. The people that do have that quality feel no compunction to tell you about it because they just have it. For example, if a person has to TELL you they are honest, they most likely are not. People who are honest just are, and their honesty is self-evident in the way they live their everyday lives. That was about as philosophical as Big Don ever got. Nice, but other insights were more practical. To wit, “peanut butter goes with everything.” Of course, the top of the culinary mountain for this was the turkey and peanut butter sandwich, the best sandwich in the universe. The key is to use fresh turkey (like after Thanksgiving) atop a generous smear of peanut butter, on the cheapest air-hole white bread, with a sprinkle of salt on the turkey, served on a flimsy paper plate, and washed down with Kool-Aid in a Tupperware glass. It's a mystical experience. So, how do you line up a seven iron chip or any putt for that matter? Why, plumb-bob it of course. Big Don took note of all the gyrations people go through in an attempt to line up a putt. He told me: “Son, there will come a time in your life when you can no longer bend over or crouch, so learn to plumb-bob.” Basically, you hold your putter between your thumb and forefinger at arm's length. Using your dominant eye, you can see the ball on either side of the shaft. It will break the opposite way. 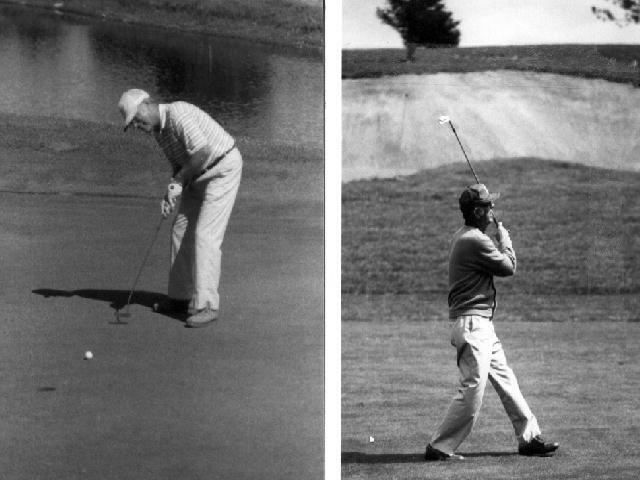 Scoff if you will, but one of the greatest putters in the history of the PGA Tour, Ben Crenshaw, touts this technigue (http://golf-info-guide.com/putters/how-to-plumb-bob-a-putt/). And you know what? I am now at the age where if I crouch I may not get up. Thanks, Big Don! When it came to Father's Day, he always told us, “Buy me something you'd want to inherit.” For most kids, this is not so easy. “Senior” fathers often have everything they need, so finding a unique gift is a challenge. I'm a gizmo guy, so here's a suggestion out of left field – a Grillbot. My bet is that your father does not have one of these. It's a robot with three rotating brushes. The website (https://grillbots.com/) claims: “The Grillbot, is the world's first automatic grill cleaning robot! Simply place the Grillbot on your grill, press a button and you're done. The Grillbot does all the grill cleaning for you. A Grillbot is the easy-to-use and fun to watch — a fully-automated device that makes grill cleaning possible with just the push of a button.” I have no idea if this actually works, but the entertainment and conversational value alone might be worth the $129.95 price. Who knows, it might become a family heirloom.